MELBOURNE, Australia - Sheikh Mohammed bin Rashid Al Maktoum has won his first Melbourne Cup. 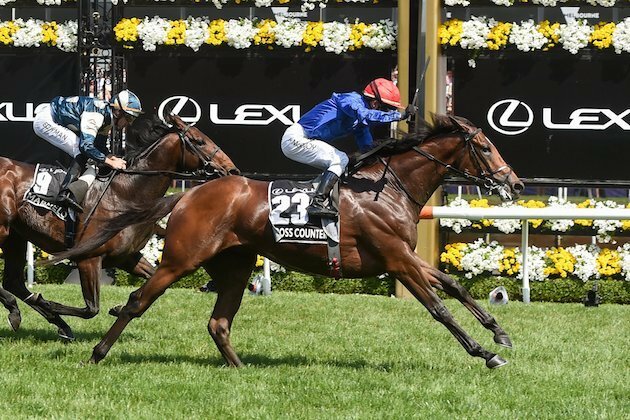 In an astonishing win, the Godolphin stable saw its runner Cross Counter come from almost the rear of the field at the top of the straight, to clinch the cup, and $4 millioon of the total $7.3million prizemoney. Trained by BritCharlie Appleby, the horse had only had 7 starts, and had a mishap since he arrived recently from Britain - and had never run the Melbourne Cup distance of 3,200 metres. Nonetheless the brilliance of McEvoy and Appleby rose to the challenge, and the rest is history. McEvoy had not only not ridden the horse before, he had only sat on him for the first time last Wednesday when he took the 3-year old for track work. Sheikh Mohammed, the Ruler of Dubai and Vice President of the UAE, is an avid owner and breeder of horses, mainly in the northern hemisphere. Until 2014, his horses in Australia ran under the Darley colours. It was in August 2014 that Godolphin established a base in Australia. McEvoy who has a long association with Sheikh Mohammed and Godolphin, was involved again when the base was established, along with other quality jockeys such as the Ron Quinton mentored-Sam Clipperton, Josh Parr and Christian Reith. Asked what he thought of Cross Counter's chances after riding him for the first time last Wednesday, McEvoy said: "He looks very genuine and he feels as though he's been around the block. UK horses can be one or the other. They can be up for the assignment or they can race a little bit green." "He doesn't ride like he's a young horse mentally. He's very switched on and willing and I am hoping that puts him in good stead," the young, Streaky Bay, South Australian-born jockey said. "Sure, you'd like them to have 20 runs rather than seven but that's why he's got in with a nice, light weight." "He might just be ahead of the handicapper, you never know," McEvoy quipped. For McEvoy it was his third Melbourne Cup winner. After the race he paid tribute to the Godolphin owner for the faith he had shown him, and the loyalty over many years. McEvoy said he was thrilled to be able to win the race for Sheikh Mohammed. Appleby told reporters after the race he had spoken to Sheikh Mohammed, who, he said, "was over the moon about the win." "It is a very special day for us all. But more importantly, it is a special day for Sheik Mohammed and team Godolphin," he said. "Obviously three of us coming into the race today, we were all agreedthat we would try to get this result. But whoever had won it, we would have all been congratulating one another. "For me, it is a very special to be here, but like I say, for a team it is just fantastic for everybody," said the British trainer. "I have spoken to Sheikh Mohammed and he's over the moon about this result." Second in the race was Marmelo and A Prince Of Arran finished third.